Despite the fact that I try to travel as much as possible, I actually hate to fly. Turbulence weirds me out. Nevertheless $ 127.00 round trip Raleigh/Durham to Fort Lauderdale was too good a deal to pass up. And it was nonstop, only about two hours on Southwest Airlines. My friend Lyman had a similar deal from Austin TX to Fort Lauderdale, also on Southwest. Both of us could take our folding bicycles in a suitcase for no extra charge. I had a seat on the airplane near the front. Southwest is a great airline. It was only eight-thirty in the morning when I got off the plane into the warm humid embrace of South Florida air. I was prepared right away, in the airport, to photograph the multiculturalism that is the Miami / Fort Lauderdale / West Palm Beach area. However these people really just look like America. Fort Lauderdale is the rare airport that has luggage storage where Lyman and I could leave our empty bicycle suitcases for four days. I picked a spot in the terminal and put the bicycle together. I bicycled off from the airport to look around. I took about a three hour bike ride, to kill time while I waited for Lyman’s flight to arrive. Just south of the Fort Lauderdale airport were a series of neighborhoods exclusively of double and single wide trailers. They were actually quite nice. The most predominant license plate on cars parked there, other than Florida, was Quebec. A few of the “houses” were a little more colorful. After leaving the neighborhoods of mobile homes, I bicycled straight west for over an hour, hoping to get as far as the Everglades but I had to turn around because of time. I bicycled back towards the airport on a bike path that followed a freeway and a drainage canal. Tootie and I lived in Miami for one year in 1983. We never saw a wild iguana, not even once. Now they are everywhere in the petri dish that is South Florida. They have, as I understand, taken off in just the past ten years. Along this canal they were more common than squirrels in North Carolina; I saw an iguana every minute or so. Most were about three feet long, if you include the long tail. Yes, I have bicycled Los Angeles and I swear that South Florida has more freeways per square mile than even Southern California. One normally takes these walking/bicycling “trails” for peace and quiet, but not in this instance. Part of the “trail” actually went right along the freeway. I did finally get back to the Fort Lauderdale airport. Lyman had arrived and we were now ready to go. The two of us had a pleasant bike ride the five miles into downtown Fort Lauderdale. I had made a reservation with an Airbnb near downtown Fort Lauderdale in a 1920’s house; a room with two single beds in a couple’s home. There was a dead Volkswagen van in the back yard. They offered us the van for free if we would just take it away! This is a really nice neighborhood; the only real problem is these tiny houses are worth close to a million dollars and are surrounded by giant condo buildings. We walked to the restaurants on Las Olas Boulevard for sushi that evening. Our trip the next day would be to bicycle from the Airbnb on SE 1st Street, Fort Lauderdale to South Miami Beach taking the inland route through Little Haiti. A woman about our age answered the door. She was quite nice and said admission was ten dollars, cash please. We stayed there over an hour and were the only visitors. We had stumbled onto what has to be one of the largest collections of Packards in the world. Packard was a luxury car maker from about 1905 until they went out of business in 1958. There were also collections of anything Packard: miniature Packard cars, Packard child’s pedal cars, Packard hood ornaments, Packard engine parts, it went on and on. Lyman and a 1958, one of the last ones made. Back on the bicycles, we cycled through miles and miles of middle and lower class neighborhoods. I like the look of modernist tract housing. But what does it look like fifty or even sixty years later? I speculate these houses with the new wave front porch were built about 1960. When they were new these houses looked exactly alike. Not now. This neighborhood has the uniquely American situation where even though a city has high housing prices there are some areas where apparently no one wants to live. It probably has a lot to do with race. This is a pretty house that needs a lot of love. We stopped for lunch at a colorful Nicaraguan/Cuban place where we split a barely edible Cuban sandwich. Little Haiti is not really much to look at, and we bicycled on through the “Miami Design District” and then downtown Miami. Downtown Miami is NOT easy or gentle bicycle riding. It is mostly huge wide roads with fast traffic, intersected by freeways. On the other hand, the Venetian Causeway, one of several bridges across Biscayne Bay from downtown Miami to Miami Beach, IS gentle and inviting to a bicyclist. Lyman stopped and helped a guy with a flat tire. This view is looking back over the area just north of downtown Miami. The causeway connects several residential islands and the roadway has a toll, which keeps car traffic to a minimum. I really like the section of Miami Beach called South Beach. It is a street grid, and one of the few places in South Florida that one can blissfully noodle around on a bicycle. What confirms it is a safe bicycling space? It is where you see women bicycling around without helmets. The Art Deco architecture is lovely. Lyman and I stopped at an Irish bar for a beer and pondered where we would stay that evening. On Hotels.com we found a room with two double beds for just over a hundred dollars including tax. The “hotel” was a little unusual, however. The room was fine, just like any motel room. You entered from an outdoor walkway. The next day our plan was to bicycle back over Biscayne Bay, then over to Calle Ocho/Little Havana, and then to the Hialeah Market Tri-Rail station. 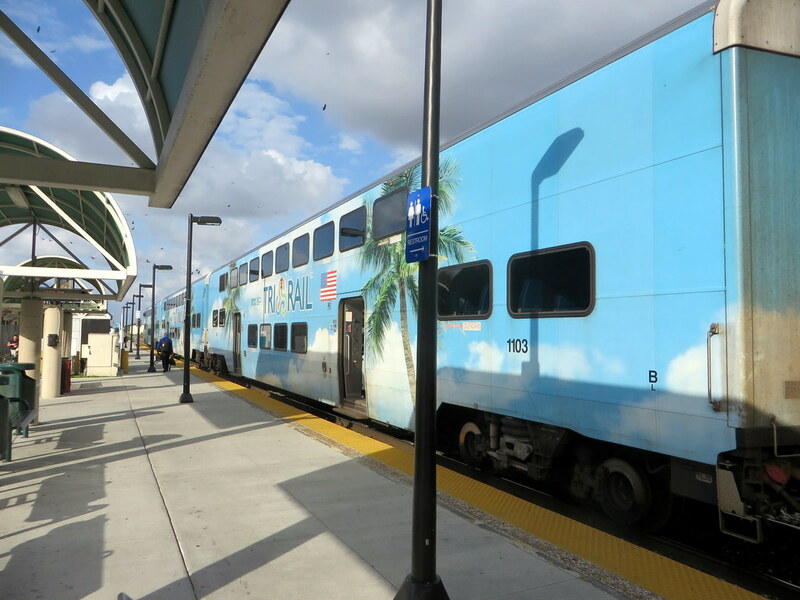 From there we would take the Tri-Rail commuter train up to West Palm Beach. Lyman commented that this older Cuban-American neighborhood near Calle Ocho really does look like current parts of Havana! Back in 1983 when we lived in Miami, Tootie and I used to get stoned before going out to eat at the big and flashy Cuban restaurant Versailles; we got off staring at the mirrors. Versailles is still there. Lyman chose Versailles as a place we could connect and have a late breakfast / early lunch with his old friend Jaime, who lives in Miami. After a nice meal we had about another forty-five minutes bicycle ride up to the Tri-Rail station in Hialeah. You can wheel the bicycle onto the train, and the ticket for the almost two hour ride to West Palm Beach only costs $ 6.90. While the train itself is fine, the stations and other infrastructure looks beat up and done on the cheap, and the train goes nowhere near downtown Miami. We got off the train in downtown West Palm Beach in early afternoon. We now had a day and a half to bicycle the sixty miles down to the Fort Lauderdale airport, where we had flights leaving the following evening. Along the beach on A1A the bicycle ride from West Palm Beach to Fort Lauderdale is really one of my favorite bicycle rides in America. You should plan it like we did here. Check out the weather, then take the commuter train against the wind and bicycle with the wind at your back! We noodled around Palm Beach on bicycles for a while, before turning south on highway A1A along the beach. Donald Trump and Rush Limbaugh live in Palm Beach. There seems to be an appreciation for showy wealth. The beach road passes between Mar-a-Lago and the ocean. From the beach side you can see that Mar-a-Lago is really a huge house that was converted to a club. Gross. Once south of Palm Beach communities vary in their displays of wealth, and change from town to town. The bicycle ride was really pleasant. About five in the afternoon we crossed a small bridge from the barrier island to the mainland, and looked for a place to get a drink and find a place to spend the night. This tropical looking restaurant in Boynton Beach overlooked the inland waterway. We had a good time talking to this guy in the blue shirt. He lives in the Philadelphia suburbs. His late parents had bought a small condo years ago here in Boynton Beach and he and his adult siblings inherited it. He was now trying to sell it because they do not use it enough. Surprisingly there are not many hotels in this area. It is all condos. And the hotels we found on Hotels.com were really expensive, like $250.00+ From Google Maps we learned of the Tiki Hut Motel, only about a mile from this bar. Google reviews were positive. The place did not appear to take reservations over the internet. I called them on the phone, and while a woman said they had one available non-smoking room with two double beds, they did not take reservations over the telephone either! Lyman and I quickly finished our drink and got back on the bicycles in the dying evening light. The Tiki Hut is on the old highway just south of Boynton Beach. A South Asian looking guy (we presume the owner, we presume that woman’s husband) was blatantly rude to Lyman as he registered and paid. The price was good, $ 90.00 plus tax. It is a weird motel. The room was clean and quite nice. The windows were openable. The beds were pleasantly firm. There was unusual art on the walls. They had unique figurines around a courtyard. Later on we walked down the highway (US1) about half a mile to an Italian restaurant. The food was fine, but not memorable. We ate at the bar, our server said it was fine if we took her picture. On the walk home we stopped at a Dunkin Donuts/Baskin Robbins for an ice cream. South Florida is populated by people who came there from somewhere else. People have to find community where they can. Here at Dunkin Donuts/Baskin Robbins at 9:00 PM these people were doing crossword puzzles. The Tiki Hut Motel glowed in the dark. The next day, Thursday, was a great day. We had about forty miles left to the airport for our early evening return flights home. We bicycled along the coast with a strong tailwind. The best meal of this trip was a late lunch on Thursday in downtown Fort Lauderdale. Just by looking at this place I conjectured from the people standing outside that there was serious eating going on. Sitting outdoors on the patio, we both got their version of salade nicoise, which was delicious, even though the fresh tuna was totally and unapologetically raw and cold. Deviled eggs. Arugula. Deep fat fried green beans. After lunch we biked the five miles to the airport and caught our flights, stopping on the way to look at the Brightline train station. After lunch we biked over to the Fort Lauderdale Brightline station. Yes, we had taken the Tri-Rail commuter train the previous day. Brightline is a new service, more or less parallel to the Tri-Rail but on different tracks. These Florida East Coast Railway tracks go directly to the downtowns of Miami, Fort Lauderdale, and West Palm Beach. It is the first significant privately run passenger rail service in the United States in fifty years. They appeared to have made a major investment. We bicycled by the station in Fort Lauderdale. The service had just starting running two weeks ago, but for now only from Fort Lauderdale to West Palm Beach, a train every hour. The ultimate idea is to run from Miami to Orlando in three hours. We had not taken this train because we did not know it was operating. Amtrak always looks beat up and cheap. This definitely does not look this way. The station and the train are lovely.